Where Are All The Reloading Components? Small commercial sized reloading setups, such as this one, gained a lot of attention at SHOT. Every time there’s a threat of additional gun control legislation, or even just a feeling that more laws may be coming, people flock to the store and strip the shelves bare of not only firearms, but the ammunition to feed those firearms. Naturally shortages soon emerge as retailers, wholesalers, and manufacturers see their entire inventory bought up. It’s not unusual then for hunters and shooters seeking ammo to start looking at reloading, and that part of the industry then sees the same shortages. The most recent iteration of this phenomenon started back in December of 2012, and we have yet to see it completely resolve itself. While rifles, shotguns, and handguns are now almost back to “normal” levels in terms of availability, the cartridges themselves are still hard to find along with the components needed to handload them. At the SHOT show this year I had the opportunity to gain some insights into the state of the industry. All of the major manufacturers and distributors had booths, as they normally do, but the number of new products was markedly down compared to past years. 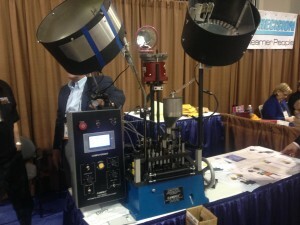 I spoke with Kent Sakamoto, the RCBS Senior Product Marketing Manager for ATK. He said they’ve been focusing on production and haven’t spent much effort in R&D for small arms. The long and short of it is that all manufacturers, even the big ones like ATK, are months behind on orders. It could be up to a year before we see supplies start to equal demand across the board. While there are shortages of components like brass and lead, the biggest problem is supplies of powder. This matches my own observations and inability to find the most common and popular smokeless powders. Rob Behr of Western Powders, a distributor for Alliant and Norma among others, reiterated what Kent had told me. They are shipping to their retailers as fast as they can, but manufacturers are unable to catch up as of yet. We can expect to see brass and bullets become available first, followed by primers and finally powders. Basically, it’s time to hang tight for a little bit longer. As manufacturers catch up, we’ll see components stay for longer and longer on the shelves at retailers. This shortage is a bit different than those in the past in that we’ve seen across-the-board shortages of not just factory cartridges, but also components. Many shooters who were caught flat footed in other recent shortages decided to get into loading their own. One could suppose that this is a good thing. It certainly helps us in the long run, but for now it also means that there’s more demand for the components that are available. In the meantime, it might be prudent to work up some alternate loads. If your favorite powder is Varget, and it’s unavailable, look up a different load using something with a similar burn rate like IMR-4320 or Reloader 15. As always, don’t mix and match incompatible components, double check your recipe against your reloading manual, and of course start low and work up to your ideal charge. Reloading for Fun, and Profit? Many people claim to have started reloading their own ammunition because of the ever increasing prices of factory produced cartridges. Is this really viable? Can you save money by loading your own plinking rounds for use at the range or during training? Let’s look at some numbers. 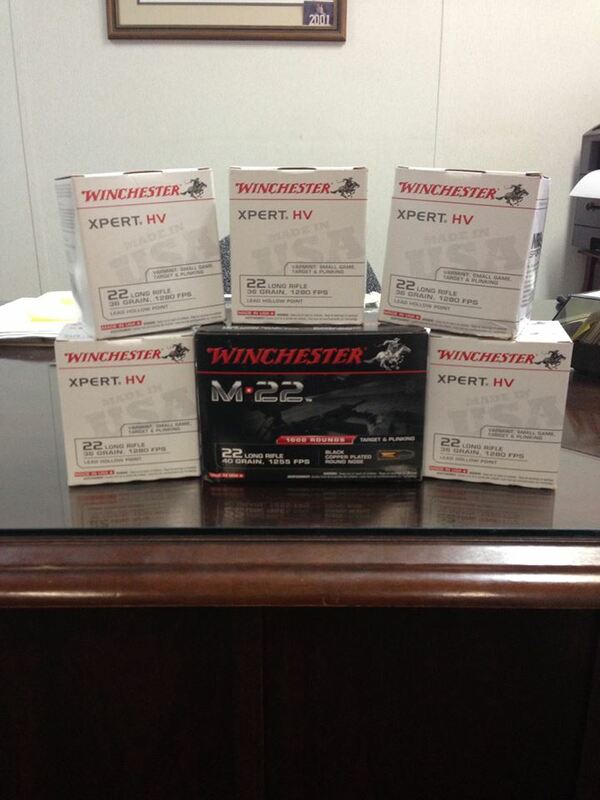 For our purposes, we’ll look at 9mm and .223/5.56mm since these are very common calibers in use today. A bit of research shows that 9mm can be found priced between $0.25 and $0.30 per round, with the less expensive available in bulk packs of 500-1000 rounds. Assuming you already have the necessary equipment to load your own rounds, how much do the individual components cost? 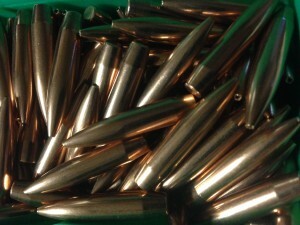 Midway USA offers 2000 rounds of 115-grain bullets for $224.99 for a total cost of $0.11 per bullet. Tula small pistol primers can be had at a cost of $115.99 for 5000, which comes to $0.02 per round. A load of 6.5 grains of Alliant’s Power Pistol should give our hypothetical load a muzzle velocity of around 1200 FPS in a handgun. A four pound keg will set you back around $63.99 and net a cost of around $0.01 per round. If we go on to assume that you have your own brass, or can scrounge some up for free somewhere, then your total cost per round is $0.15 (rounded) or about half the cost of factory ammo. Not bad, right? Not so fast. These prices don’t include shipping and the required hazmat fee. It’s possible, though unlikely, that you can find similar prices at your local retail shop, so let’s go with these numbers for now. 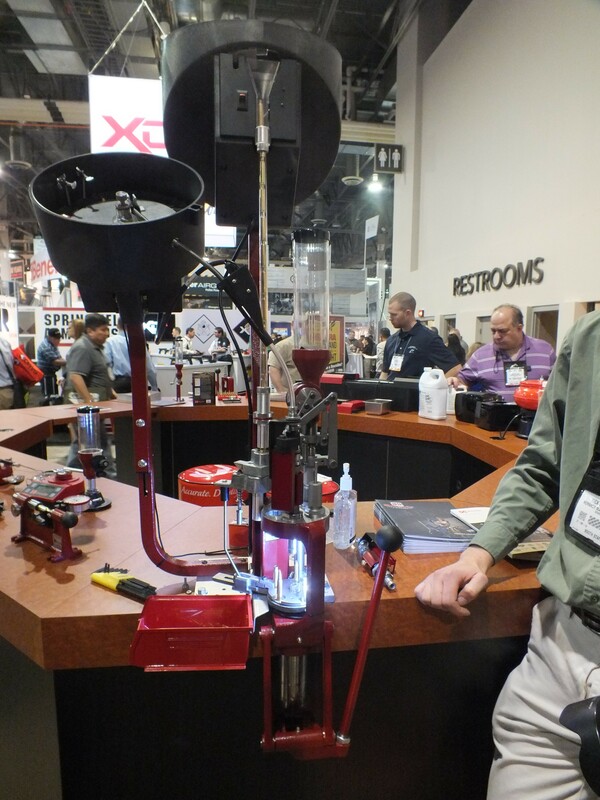 How much did your reloading press cost? Dies? Scales? The list of equipment needed is quite long, but we’re spit-balling here so let’s just say you found everything you need at a garage sale for the low price of only $250. If that’s the case, your break-even point comes around 1650 rounds. If you have to buy brass for those cartridges, the break-even point doesn’t come until you’ve loaded over 2500 rounds. For .223/5.56 ammunition the numbers are similar. If you already have your own brass, it’s possible to load rounds for about $0.17 each. That cost jumps to $0.37 per round or more if you have to buy once-fired and even more for new brass. Factory prices for .223 and 5.56mm ammunition in bulk run from $0.28 to $0.30 per round if you can settle for steel cased ammunition. Brass cased cartridges can still be found for as little as $0.35 each. If you’re out of .223 or 5.56 brass, you’re out of luck: loading your own is a losing proposition. This is partly due to the presence of enormous amounts of military surplus ammunition. Still, if you do have your own cases you can save a few bucks by reloading. Using our hypothetical $250 setup your break-even point still won’t come until you’ve loaded more than 2000 rounds. Don’t forget to factor in your own time when running your own numbers. Time is valuable, and depending on the type of press you’ve got it can take quite a while to clean, prep, and load those thousands of rounds. You can save time with a faster progressive press, but this increased cost will mean that your break-even point doesn’t come until much later. It’s also important to consider how much you shoot. If you’re like most, you might only go through a few hundred rounds a year. Avid shooters might fire a couple of thousand rounds, while serious competitors and those seeking intensive training might fire upwards of ten thousand rounds. If you only plink occasionally it could easily take you years to recoup the cost of investing in a reloading press. Where do you fall? Take the time to crunch some numbers on your own. 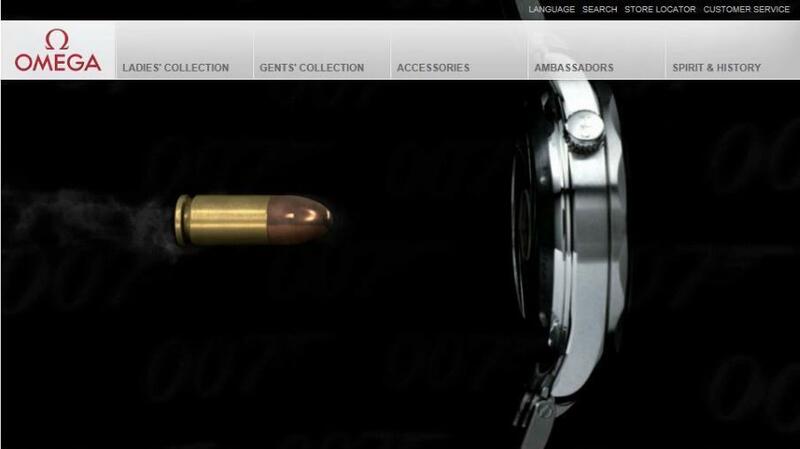 The prices laid out here are just an example, and will vary depending on what caliber you consider as well as your locale. It’s certainly feasible to save quite a bit of money loading your own ammunition. If you shoot frequently, or just want to have a nice stockpile of a few thousand rounds, reloading just may save you a buck or two. To calculate your own savings visit this handy calculator at Handloads.com. With ammunition shortages occurring more and more frequently, and prices on cartridges going ever skyward, it seems like growing numbers of people are becoming interested in handloading or reloading their own cartridges. Availability during shortages, and a fear of high taxes on ammo or restrictions on sales, is a big motivator. Of course, you could just as easily store large quantities of cartridges. 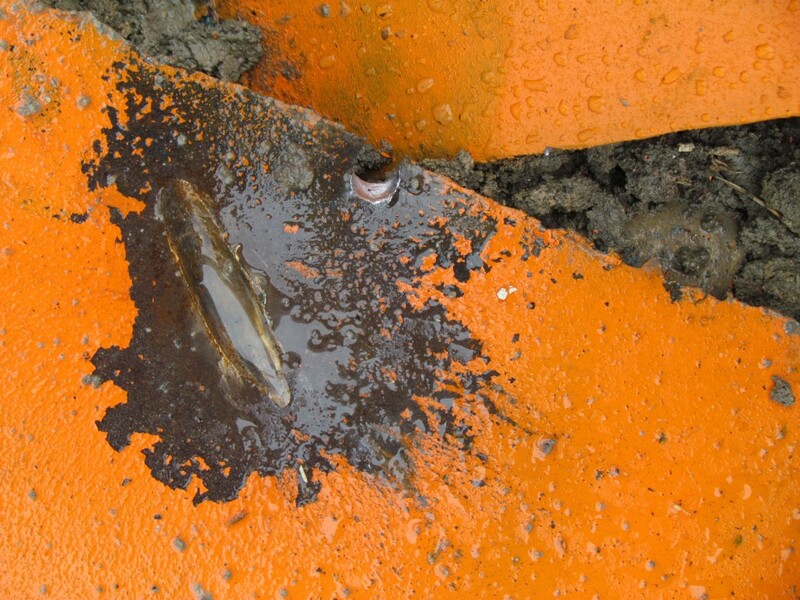 Some components such as powder will degrade over time simply by sitting on the shelf, and this can present a problem. Not all powders degrade safely. Additionally, if exposed to too much humidity it won’t fire, at least not very well, when loaded. If you find yourself without certain necessary items during a shortage, primers for example, your ability to load your own ammo will be seriously curtailed. It takes a bit more planning, but by keeping tally of the date of manufacture of your components you can avoid problems. It used to be that economy was one of the biggest reasons to handload, but with production capacity of large manufacturers growing and the steadily increasing cost components such as lead, copper, and primers, the price advantage has dwindled. You can still save a few pennies per round on common calibers such as 9mm and .45 ACP, more on rifle cartridges, but when you take into account the startup costs of getting the required equipment it’s possible that it may take far longer than originally anticipated to recoup the investment. You might find that unless you simply enjoy the meditative aspect of handloading your time might be better spent doing other things. Having control over the quality of your own ammunition is the primary reason I handload my own cartridges. Sorting bullets by size and weight and using exacting standards when preparing your brass and measuring your powder charge pays off in dividends when extreme accuracy is the goal. For competition rifle shooters, especially those who fire benchrest or compete in extreme long-range events out past 1,000-yards handloading is nearly a requirement. Crafting precision ammunition to such fine tolerances can be a hobby by itself. Specialty applications such as Remington .22 BR and 6.5-284, or obsolete calibers such as .577-450 and 7.7×58 are all perfectly suited for handloaders. Benchrest shooters not only load for exacting quality, but also because many of the calibers favored by those in the sport are not commonly available. The same goes for antique and C&R (Curio & Relic) collectors who own and enjoy shooting firearms chambered for ammunition that is no longer available. Still thinking that rolling your own ammo is for you? There are some startup costs to consider. A press, scale, dies, scoops, and a reloading manual, on top of your cartridge components (powder, brass, primers and bullets) are bare minimum requirements and can set you back a hundred dollars or so. More expensive setups and additional accessories such as tumblers and media, case trimmers, and trays can jump the price up even more. If you handcast your bullets for low pressure rounds you might save a little on components, but the molds and lead-pouring equipment will add some to your startup costs. 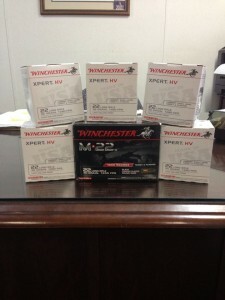 Getting into handloading or reloading ammo is a bit of an investment. Storing your equipment will take up a significant amount of room and you’ll need a well lit area to spread out when it’s time to load. If you’re like me, convincing your spouse may also take some effort. The rewards however, whether it’s economy, availability, or precision, may make it worth it. Author’s Note: This article originally appeared in the November 2013 issue of Western Shooting Journal. 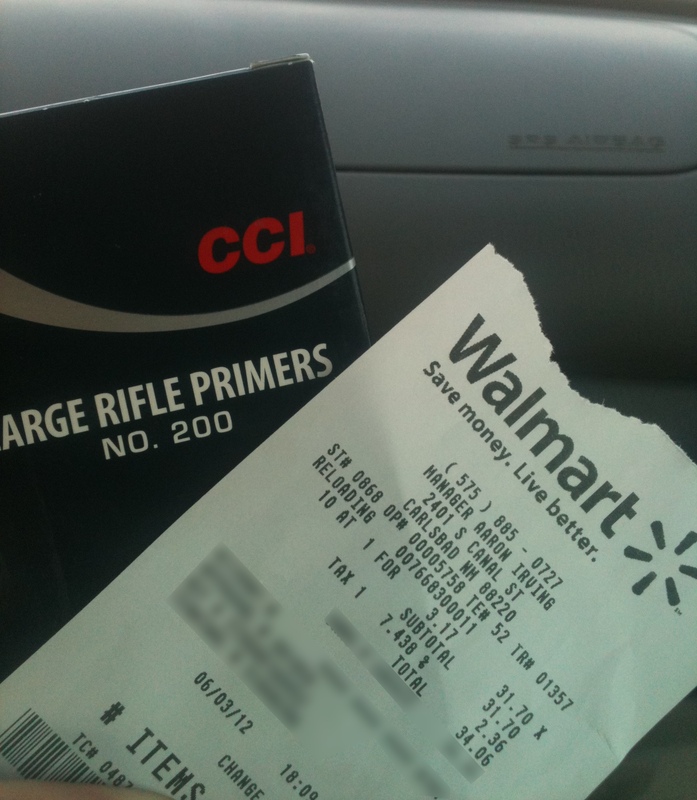 Tired of swinging by the ammo counter at Wally World every day just to check and see if they have anything in stock? This video below shows you how you can track the inventory of your local Wal-Mart without having to physically go to the store. Apparently it is browser specific, but does still work. Give it a whirl. What happens when a new shooter firing my M82A1 skipped a .50 BMG round off of the ground 250 yards short of the target. Remington has issued a recall for certain lots of its 250 grain Scenar Match ammunition. If you have .338 Lapua, check for the lot numbers outlined in the press release below. Reloading Components at Wally World? $34.06/1000 primers, including tax. Considering you don’t have to pay the Hazardous Materials fee, that’s not a bad price really. 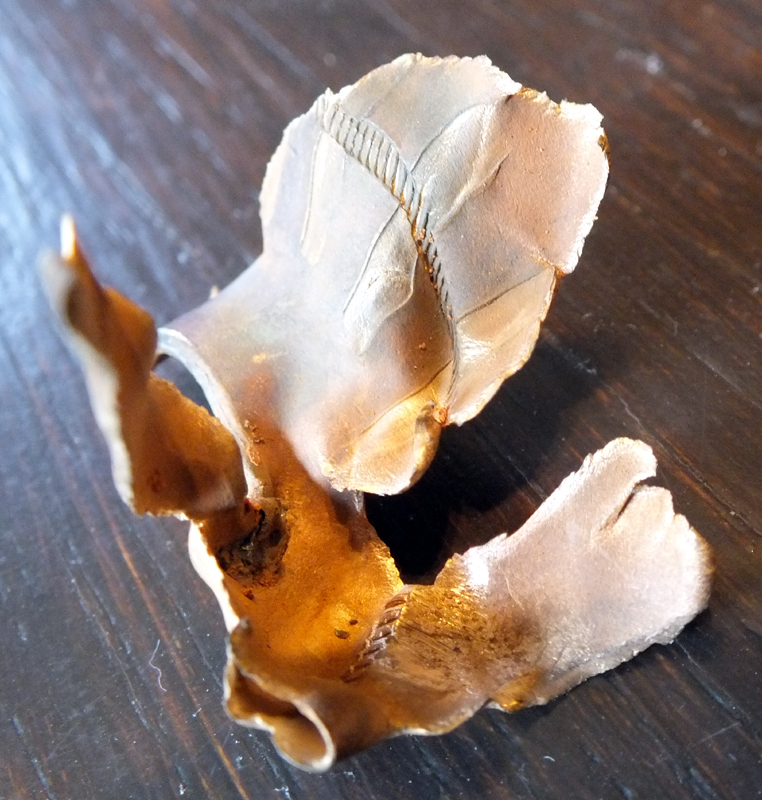 They also had powders, shotgun hulls (new and once fired) along with shot there. No bullets or brass. Still, it’s progress. 50 BMG jacket we recovered from the berm.